Jeremy Corbyn has been leader for nine months so it’s time to update my tracker of his performance compared with that of his predecessors. After a slight improvement around six months, the proportion supporting Labour has fallen to where it was before Corbyn was elected. This means Corbyn’s Labour is now, jointly, the most unpopular the party has ever been after nine months of any post-war new leader. It’s essentially tied with Brown’s Labour, after the financial crisis had hit and he’d bottled the election. Every previous post-war Labour leader that took over the party in opposition with a voting intention below 45% increased its score by several points and retained most of those gains until at least the end of their first year. Corbyn, who took over the party with it polling around 31%, its second-lowest for any new leader, has not sustained any improvement in the proportion that would vote Labour. In mid-March Labour had four consecutive polls between 34-36%, but that slight boost has since disappeared. That is despite the government being split on Europe, u-turning on major decisions and having had a senior cabinet minister resign in protest against its policies. In comparison with other Labour opposition leaders, Corbyn’s Labour is 7pts behind where the next lowest, Kinnock, was after nine months, when Labour was still 13 years away from winning a general election. It is 10pts behind where Miliband’s Labour was at the same point, when the party had just been kicked out after 13 years in power. 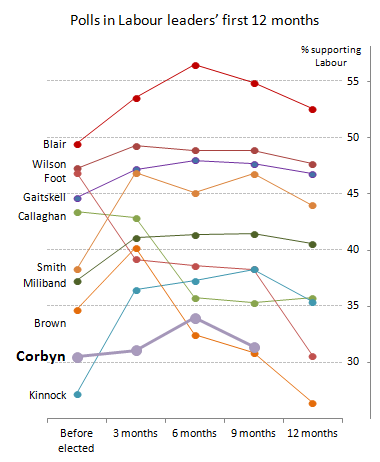 Compared with the election-winning leaders, Labour is now 18pts behind Wilson and 24pts behind Blair. Polling Matters: should Leave focus on immigration? I was on Polling Matters again this week, talking – as usual at the moment – about the referendum. Other than a discussion of whether the polls really have narrowed the main question was whether the Leave campaign should focus on immigration.